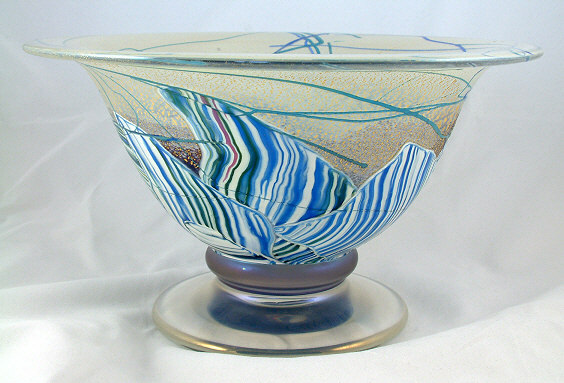 This site is for collectors and enthusiasts of Isle of Wight Studio Glass. We aim to make it a focal reference point by providing documentation and a visual reference for the wide range of art glass produced by the studio. The glassworks was founded in 1973 at St. Lawrence, Isle of Wight, by one of the great innovators of the British art glass movement, Michael Harris, and his wife Elizabeth, also a noted designer. The tradition of innovative glass design was continued after Michael's death in 1994 by his two sons Timothy and Jonathan. Timothy is still the master glassmaker at IOWSG but Jonathan left IOWSG in 1999 to found his own glassworks in Ironbridge, Shropshire. Unfortunately, the studio at St. Lawrence went into liquidation in January 2013. Happily, the studio was re-established with new funding from within the Harris family and a new studio was created at Arreton Barns Craft Village, Isle of Wight in June 2013. There was no glassmaking in 2013. The studio restarted making glass in a new furnace in late March 2014, with pictures of the first test pieces posted to Facebook on 27 March. On the Collections pages you will find links to all of the named glass collections produced by Isle of Wight Studio Glass as well as a selection of experimental and one-off pieces produced since the 1970s. This site will not cover Mdina Glass, which Michael Harris founded with his business partner Eric Dobson in 1968 on the island of Malta. Neither are pieces produced by St John's Glass on the Isle of Man under licence from IOWSG in the 1980s covered here (but see the Azurene page for items produced on the Isle of Man which could be confused with IOWSG). Glass produced in the Kerry Glass style is covered here only if IOWSG paper labels are on the piece. For each of the IOWSG named collections you will find information on the dates it was produced, who designed the collection, information on the various colourways, and lots of images. The site started out fairly modestly in 2008, but continues to grow in depth of coverage. Please note that there are other art glass studios on the Isle of Wight, including Alum Bay Glass, Diamond Isle Sculptured Glass and Glory Art Glass, but these studios are not covered by this web site. For the time being we will be restricting contributions to this site to those specifically invited. But we hope to open it up to general contributions some time in the future. Please note that this site is not officially connected to nor sanctioned by the company of Isle of Wight Studio Glass. It is purely an enthusiasts site. All text and pictures on the site are the contributors' own and not that of any other copyright owner except where specifically acknowledged. Images belonging to other copyright owners are used with express permission in writing kept permanently on file. Brief 'fair use' quotations from reference works, such as Mark Hill's excellent book Michael Harris: Mdina Glass & Isle of Wight Studio Glass or other sources are properly acknowledged.